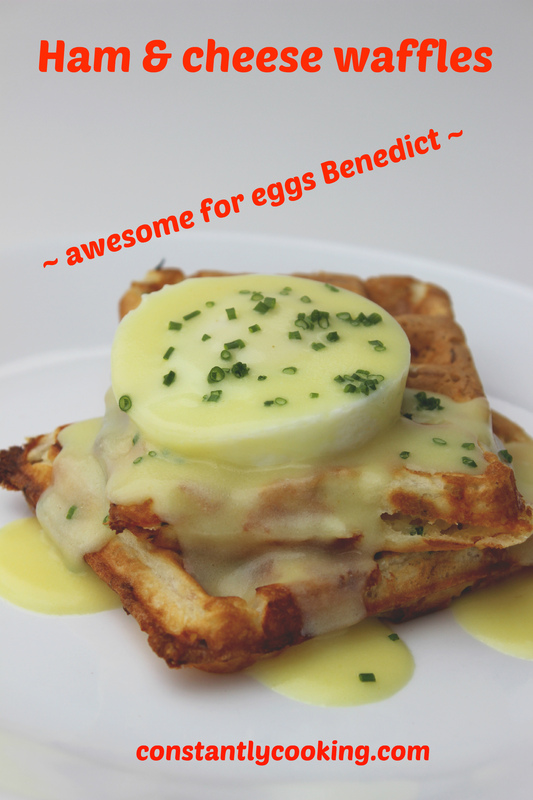 Awesome alone but even better for eggs Benedict! Anyone who knows me knows I am infatuated with waffles. I love sweet variations, served with fruit and maple syrup, of course, but lately I’ve been playing around with savoury waffles too. These cheddar and onion beer bread ones were a huge hit, as were these chive cornbread waffles. But I have to say, this latest variation really hits it out of the park. Light, fluffy and crammed with flavour. I can see using these waffles in all sorts of inventive ways (grilled cheese sandwiches, perhaps). I like to measure out the dry ingredients the night before, as well as prepping the chives, ham and cheese and tucking it into the fridge so that the assembly time in the morning is super speedy. Like most waffles, these reheat beautifully in the oven (or even in a toaster) so you can cook them ahead of time if you prefer. Preheat waffle iron; preheat oven to 300F and place a wire cooling rack on a baking sheet. Set aside. In a large mixing bowl, whisk together flour, baking powder and sugar. Stir milk, egg and butter into flour mixture until just combined. Fold in chives, ham and cheese. Brush waffle iron plates with vegetable oil or your favourite cooking spray. Pour appropriate amount of batter (amount will vary depending on your waffle iron) onto preheated iron this quickly and gently spread it to the edges with the back of a spoon. 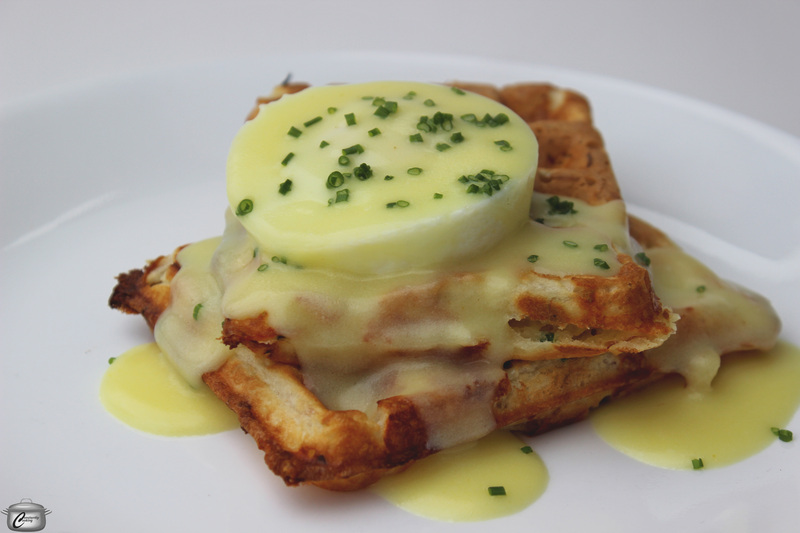 Cook until waffles are golden, 6 – 8 minutes. Repeat with remaining batter, re-greasing waffle iron between batches. Serve immediately or keep warm on wire rack in preheated oven for up to 30 minutes before serving. Makes approximately 8 waffles, depending upon your waffle iron. This entry was posted in Breakfast, brunch and tagged breakfast ideas, brunch ideas, cheese, chives, Christmas, creative eggs benedict, creative waffles, eggs Benedict, Father's Day, ham, ham and cheese, Mother's Day, Paula Roy, savoury waffles, waffle iron, waffles, what to make for brunch. Bookmark the permalink.